Kalimpong: Music composer A. R. Rahman on Monday called for preserving the purity of Sikkim's environment and sharing it with the world on a day he was officially appointed the brand ambassador of Sikkim Tourism by chief minister Pawan Chamling. Rahman was the star attraction at the inauguration of the 11-day Sikkim Red Panda Tourism Carnival at the Palzor Stadium in Gangtok where he was formally introduced as the state's brand ambassador. "Sikkim has grown to be known as one of the most environmentally beautiful places in India and in the world. Our task is to appreciate this and preserve this glory of this great culture at every opportunity and not hesitate to share it with the world," Rahman told a large gathering at the gala function. Stating that Sikkim had very many things to showcase to the world, the global icon said he felt privileged and was honoured to become its brand ambassador. "I am so privileged and honoured to be your state ambassador, and as the state ambassador, I invite you to where I come from so that you give my community the opportunity to reciprocate the hospitality and love (shown towards him by the Sikkimese people)," said the Chennai-based celebrity. The Sikkim chief minister, in his speech, thanked Rahman for agreeing to become the brand ambassador. "We must maintain the beauty of the state in honour to make it a haven for tourists," he said, while mentioning the many accolades received by the state for being an environment-friendly destination. 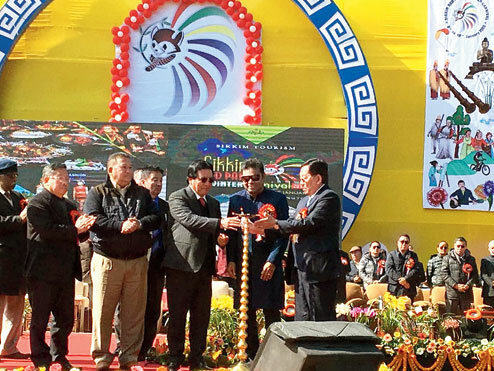 A colourful cultural programme by different ethnic communities was presented at the inaugural function of the carnival, which is being organised by the Sikkim tourism and civil aviation department. Marching bands of the state police and a local school also entertained the crowd. A martial arts display and a joint performance by 100 guitarists were part of the fare on the opening day. A host of events will be held in and around Gangtok during the carnival period. They include musical shows, cultural programmes, adventures sports and exhibitions. The majority of the events will take place at M.G. Marg in the heart of the state capital. Music composer A. R. Rahman on Monday called for preserving the purity of Sikkim's environment and sharing it with the world on a day he was officially appointed the brand ambassador of Sikkim Tourism by chief minister Pawan Chamling.